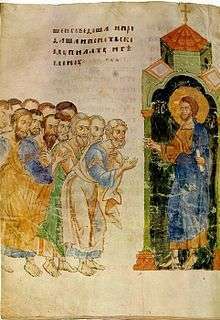 Jesus and his Apostles, from the Russian Siysky Gospel, 1340. The saying of Jesus concerning his true relatives is found in the Canonical gospels of Mark and Matthew. his brethren stood without, desiring to speak with him. standing outside." He said to them, "Those here who do what my Father wants are my brothers and my mother. They are the ones who will enter my Father's kingdom." emperor's people demand taxes from us." He said to them, "Give the emperor what belongs to the emperor, give God what belongs to God, and give me what is mine." Verse 100 (Caesar's Coin) is similar to Mark 12:13-17 and Luke 20.22-26. Verse 101 (Love Jesus/God more than your family) is similar to Matthew 10:37 and Luke 14:26-33.